While denim jeans have been a clothing staple for men since the 19th century, the jeans you’re probably wearing right now are a lot different from the denim jeans that your grandpa or even your dad wore. 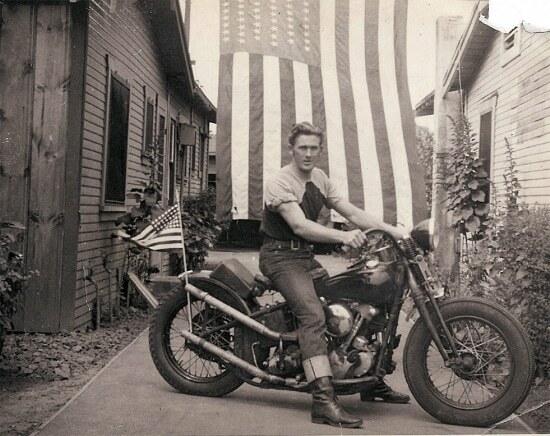 Before the 1950s, most denim jeans were crafted from raw and selvedge denim that was made in the United States. But in the subsequent decades, as denim went from workwear to an everyday style staple, the way jeans were produced changed dramatically. With the implementation of cost cutting technologies and the outsourcing of manufacturing jobs to developing countries, the quality of your average pair was greatly reduced. Changes in consumer expectations altered the denim landscape as well; guys wanted to pick up pre-washed, pre-faded, pre-broken-in, and even pre-“ripped” jeans that “looked” like they’d been worn for years. But about a decade ago, the pendulum began to swing back again. Men started pushing back against the low-quality, cookie-cutter, pre-faded jean monopoly. They wanted a quality pair of denim jeans and to break them in naturally. They wanted to pull on the kind of American-made dungarees their grandpas wore. To give us the scoop on raw and selvedge denim, we talked to Josey Orr (fast fact: Josey was named after the protagonist in The Outlaw Josey Wales), co-founder of Dyer and Jenkins, an L.A.-based company that’s producing raw and selvedge denim right here in the United States. Note: This is not a sponsored post. I just hit up Josey for the inside dope on denim because he’s a cool young dude who makes awesome jeans, has an awesome beard, and knows his stuff. To first understand raw and selvedge denim jeans, it helps to know what those terms even mean. If you’re reading this in the email, click here to watch our video intro to raw and selvedge denim. Most denim jeans you buy today have been pre-washed to soften up the fabric, reduce shrinkage, and prevent indigo dye from rubbing off. Raw denim (sometimes called “dry denim”) jeans are simply jeans made from denim that hasn’t gone through this pre-wash process. Because the fabric hasn’t been pre-washed, raw denim jeans are pretty stiff when you put them on the first time. It takes a few weeks of regular wear to break-in and loosen up a pair. The indigo dye in the fabric can rub off as well. We’ll talk more about this when we go over the pros and cons of raw denim below. Raw denim (all denim actually) comes in two types: sanforized or unsanforized. Sanforized denim has undergone a chemical treatment that prevents shrinkage after you wash your jeans. Most mass-produced jeans are sanforized, and many raw and selvedge denim jeans are too. Unsanforized denim hasn’t been treated with that shrink-preventing chemical, so when you do end up washing or soaking your jeans, they’ll shrink by 5%-10%. During the 1950s, the demand for denim jeans increased dramatically. 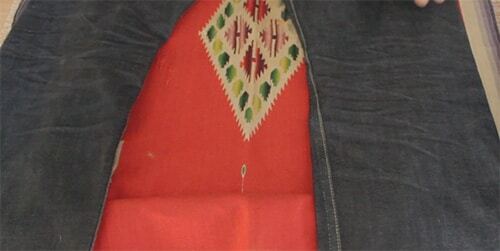 To reduce costs, denim companies began using denim created on projectile looms. Projectile looms can create wider swaths of fabric and much more fabric overall at a much cheaper price than shuttle looms. However, the edge of the denim that comes out of a projectile loom isn’t finished, leaving the denim susceptible to fraying and unraveling. Josey pointed out that contrary to what you may hear from denim-heads, denim produced on a projectile loom doesn’t necessarily equate to a poorer quality fabric. You can find plenty of quality jean brands from denim made on projectile looms. Most jeans on the market today are made from non-selvedge denim. The pros of this have been the increased availability of affordable jeans; I recently needed a pair of jeans in a pinch while on a trip and was able to score a pair of Wrangler’s at Walmart for just $14. But consumers have been missing out on the tradition and small quality details of classic selvedge denim without even knowing it. 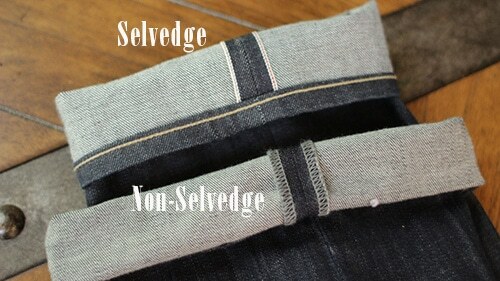 Comparison between selvedge and non-selvedge jeans. Notice on the non-selvedge jeans that there isn’t a clean edge on the fabric near the seam. Thanks to the “heritage movement” in menswear, selvedge denim jeans have slowly been making a comeback during the past ten years or so. Several small, independent jeans companies have sprouted up (like Dyer and Jenkins) selling selvedge denim jeans. Even some of the Big Boys (Levis, Lee’s) in the jean industry have gotten back to their roots by selling special edition selvedge versions of their jeans. The problem with this selvedge denim revival has been finding the selvedge fabric to make the jeans, because there are so few factories in the world using shuttle looms. For a while, Japan held a near monopoly on the production of selvedge denim because that’s where most of the remaining shuttle looms are; the Japanese love everything post-WWII Americana, and they’ve been sporting 1950s-inspired selvedge denim jeans for a long time now. Japan remains the world’s top producer of high-end selvedge denim. But there are a few companies in the U.S. producing denim on old shuttle looms as well. The most prominent selvedge denim mill is Cone Cotton Mill’s White Oak factory in North Carolina. White Oak sources the cotton for their denim from cotton grown in the U.S., so their denim is 100% grown and woven in the USA. 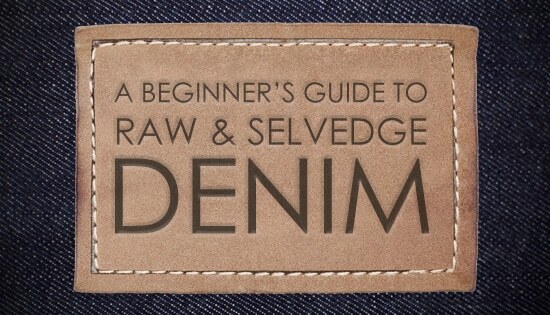 Make sure to keep this distinction in mind when you start shopping for selvedge or raw jeans. Upfront costs are typically very high. There are varying price levels for raw and selvedge denim, generally ranging from $50 to $300. The lower-priced selvedge and raw denim jeans (like the kinds you find at Gap) are usually manufactured in developing countries. However, there are a few brands that make their jeans in China and still charge $200+ for a pair. If you want to buy a quality pair of jeans made in the U.S.A, from denim manufactured domestically, look to spend at least $90-$120. Always keep in mind that higher prices don’t necessarily equate to higher quality. Higher priced selvedge and raw denim brands usually make their jeans from the same White Oak denim factory fabric as the more affordable brands. While the higher sticker price might reflect stylistic details that lower priced denim brands ignore, the high price of most designer denim jeans is often an attempt by brands to artificially create a high value in the mind of the consumer. Remember, price does not equal value! They take a while to break in. Unlike most mass-market jeans that are oh-so-soft when you first put them on, when you initially don a pair of selvedge/raw denim jeans, they’re going to be super stiff. Depending on the weight of the fabric, it may feel like you’re wearing two plaster casts on your legs. Give it some time, wear them every day, and your jeans will soon start to soften up. Sizing can be tricky. This is based on my personal experience. Most major jean brands use “vanity sizing” on their jeans. Which means while you may have a 34” waist, the sizing label on the pant will say 32” to make you feel better about yourself. Most selvedge jean brands don’t use vanity sizes (grandpa wouldn’t approve), so you can’t use the size of your Old Navy pants to gauge what size you should buy in selvedge and raw denim. You’ll need to actually measure yourself (we show you how below). They’re mostly available online. If you live in a big city, you can probably find a brick and mortar store that you can visit to try on a pair of selvedge and raw denim jeans. Because of the tricky sizing with selvedge denim, being able to physically try on a pair just makes things easier. If you’re like me and live in a smaller city, your only option for buying raw and selvedge denim is online. This, of course, makes finding the best fitting pair of jeans a pain. I’d recommend buying two different sizes of the same jean so you can find the pair that fits just right, and send the other back; make sure the company offers free exchanges and returns. Indigo can rub off. Because raw denim hasn’t been pre-washed, there’s a lot of indigo dye in the fabric that can easily rub off on whatever it comes into contact with, like seat cushions, car seats, and your shoes. Hey, you’ve always wanted to leave your mark, right? After a few weeks of wear and a washing, the indigo bleeding stops. And even if you do experience an occasional indigo rub off, removing the stain isn’t all that difficult. They’re durable. Because of the selvedge edge and the often heavy weight of raw denim, selvedge and raw denim jeans can hold up for a long time, even with near daily wear. A quality pair of raw/selvedge jeans, properly taken care of, can last anywhere from a few years to a decade. And if they do rip or wear out, they can always be patched up and repaired and put back into service! Better value. While raw and selvedge jeans can have a high upfront cost, because of their durability, the long-term cost-per-use can actually make raw and selvedge denim a value buy. Instead of replacing a pair of mass-produced globocorp jeans every year, your raw and selvedge jeans will likely last you for a long time. They’re (usually) made in the USA. If you like to shop American-made, then raw and selvedge denim is for you. While Japan is still the leader in producing quality selvedge denim, the U.S. is quickly catching up. While most raw and selvedge denim jeans available in the U.S. are made domestically, there are some brands that do make theirs in third-world country sweatshops, so always check the label. They look great. Raw denim is dark denim and dark denim is probably one of the most versatile pieces of clothing you can own. Raw denim jeans look much sharper than a faded pair of Wranglers, and not only can you wear them with a t-shirt and a pair of Converse shoes, you can also pair them with a dress shirt and a sport coat for a night on the town. They’re personalizable. While mass-produced jeans come with faux fading and distressing that is the same for every single pair, with raw denim, you create the fading and stressing based on your body type and how you actually wear them. There are different types of wear patterns that may appear in your raw denim such as honeycombs on the back of the knee or “whiskers” on your thighs. Each pair is uniquely yours. Example of “whiskers” fading on the upper thigh. Example of “honeycomb” fading on the back of the knee. Because you’ll likely be buying your raw and selvedge denim jeans online, it’s important you get the measurements right. Measure yourself. 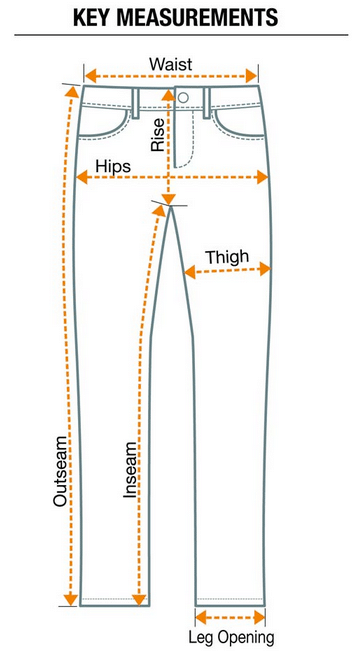 There a few key measurements you’ll need for getting a proper fit on jeans. The most important are the waist and inseam, but you’ll also want to measure the front rise, back rise, thigh, and leg opening. Josey breaks it all down for us in the video below. Also, take a gander at the diagram from Real Men Real Style. If you’re reading this in an email, click here to watch video on how to measure for raw denim jeans. Remember, unsanforized denim hasn’t been treated to prevent shrinking, so when you wash or soak your jeans for the first time, they’ll shrink by 5%-10%. When purchasing jeans made with unsanforized denim, you’ll need to buy jeans a few sizes larger than you normally would and soak the jeans before you put them on so they shrink to the appropriate size. Decide on fit. Most raw and selvedge denim jeans come in two fits: slim and regular fit. What each brand considers “slim” and “regular” will differ, which is why it’s so important to double-check their respective sizing guides. Slim fit. Slim fit jeans have narrow thigh openings and are designed to hug your body (avoid this fit if you have thighs bigger than your head). If a brand doesn’t offer a slim fit, but you want a closer-fitting style, just buy your jeans a size down. Raw denim stretches a bit (about an inch at the waist) so you shouldn’t have a problem with fitting into a smaller pair of jeans. That’s the answer Josey gave me when I asked him. There’s a lot of selvedge/raw denim old wives’ tales floating on the internet about breaking in your jeans. Some folks say you need to wear them in the ocean and then roll around in the sand to break them in (preferably while reenacting the love scene from the film From Here to Eternity, I gather) or that you need to soak them in starch so you can get some really “sick fades” — high contrast lines/fading in your jeans. There are indeed things you can do to create “sick fades” in your jeans, but in my opinion that’s too pretentious for a pair of workwear. Just wear your raw denim jeans regularly and let nature take its course. The only exception you should make for pre-soaking a new pair of jeans is if they’re unsanforized. Soak unsanforized jeans before you start wearing them so they shrink to the appropriate size. Another one of the old wives’ tales out there is that you should never (and I mean NEVER dammit!) wash your jeans. Or if you do wash them, you should wait at least a year. And if your jeans get smelly, just put them in the freezer to kill the bacteria. Or something. The reason people tell you not to wash your jeans is so you can achieve those wicked sweet fades in the fabric. But all of that no-wash advice is bogus and will just leave you smelling like a hobo. What you want to do is to strike a balance between distressing the jeans and washing out the fabric’s indigo and your fades-in-the-making too quickly, and them smelling like swamp crotch. To achieve this balance, wash them every two months. Remember, denim jeans are workwear. Do you think 19th century miners were holding off on washing their jeans just so they could get fades? No, and neither should you. While washing your jeans every 2 months might seem too frequent to a raw denim purist, it probably seems too infrequent compared with how often you’re used to washing your regular jeans. But you honestly don’t have to wash your jeans all that often. 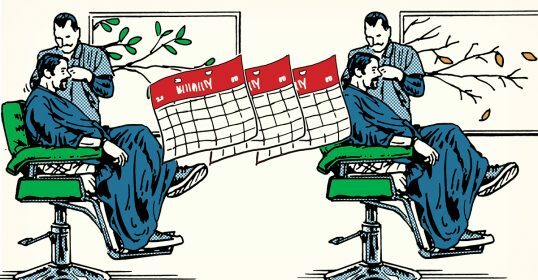 If they’ve started smelling before the 2 months is up, then giving them a wash early is a-okay. 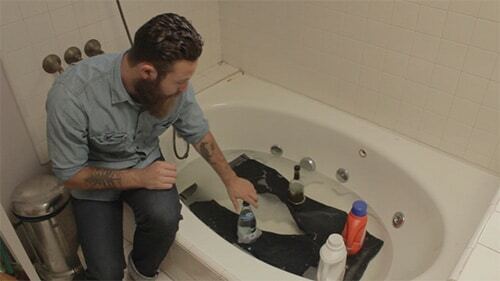 There are a bunch of ways to wash your raw denim jeans. The easiest is to simply turn them inside out and wash them in cold water in the washing machine using Woolite. The first few times you wash your jeans, you’ll probably want to wash them by themselves to avoid the indigo bleeding onto your other clothes. 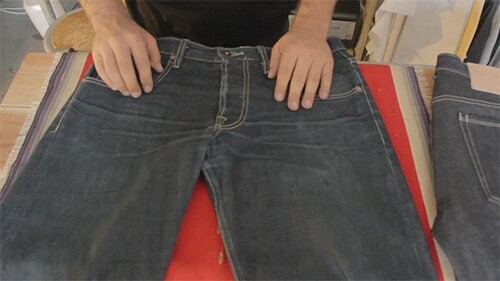 If you’re reading this in an email, click here to watch the video on how to wash raw denim. If you’re looking for more info on raw and selvedge denim, be sure to check out Heddels and Self Edge. Thank you to Josey Orr from Dyer and Jenkins for his insights into raw and selvedge denim. If you’re looking for an entry pair of quality raw and selvedge denim that’s made right here in the U.S., be sure to check them out!